Today was just an amazing day! I’d like to think that today I reached a pinnacle. Today I touched and embraced my expansion. It was incredibly cold (at least for a southern girl like me), the wind was chilling my very bones, but I was exhilarated by the day. I just knew something magical was going to happen! I kept to my word and went out to experience something for one hour. I wasn’t sure what that would be, but this is my life and I know that I am always in the right place at the right. The day was crisp and the sky was incredibly blue with traces of clouds and plane trails. 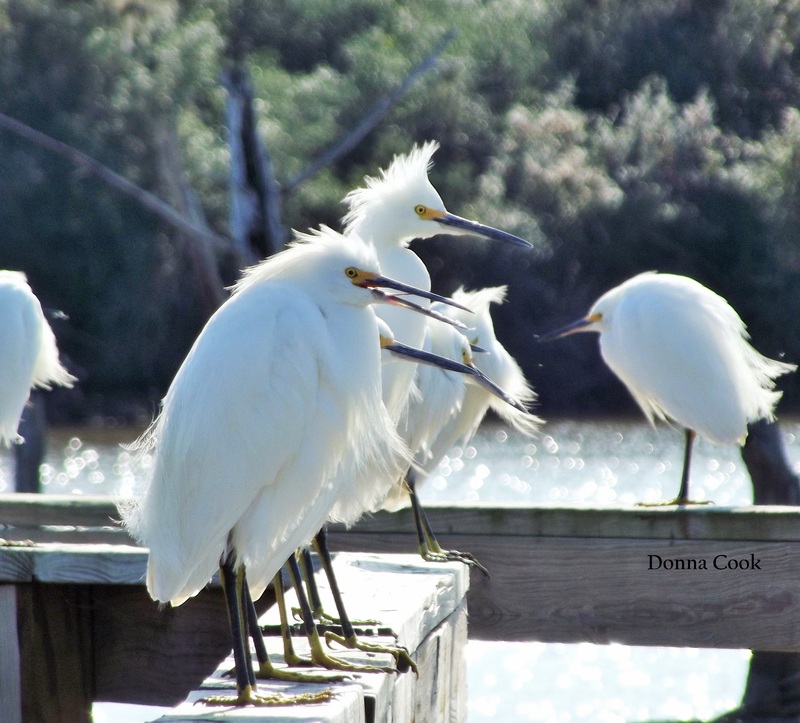 When I approached my favorite spot ( the pier) I was pleasantly surprised by an amazing array of egrets. There had to be at least 10-15 of them. I approached cautiously as not to scare them, but they didn’t go anywhere. It was as if they could tell this was a photo op for them and they were so funny! They allowed me to get within 10 feet of them as I clunked along with my cameras. It was so beautiful to be in their vortex and to just be going with the flow. To me it was as if they were welcoming me into their world and it felt so freeing. I was amazed at all the wildness in this space. There were not only egrets, but there were ibis, cranes, whooping cranes, spoonbills…EVERYWHERE! The vultures and the osprey where in the flying on the breeze in the distance. It was Donna’s definition of heaven. I walked around taking what had to be 100’s of pictures. I went down to the end of the pier and just closed my eyes and envisioned how spectacular this all is! Thank you God for this moment! I saw another group of Ibis’s land on the east side of the pier and proceeded to take pics of them as well, when I saw a man on the beginning of the pier walking my way. He had a camera as well. I motioned to him where the shot was, but he didn’t take the shot and continued to walk my way. There was something about him that instantly set me at ease. He was tall with gray hair and crystal blue eyes. I kinda got lost in those eyes. They matched the sky! He was dressed in a charcoal gray wool coat and scarf and his hat was on backwards. We talked for about 30 minutes about so many things…our mutual love of photography and the wild life here in Texas. We talked about how we were both Brats. His dad was in the Army and mine was in the Marine Corp. We talked about astro engineering. That’s what he does. We talked about so many things…but then our time was up and we had to go, or at least I did…work and all! But this was kinda magical for me. I have imagined this man in my dream for years and here he was right in front of me! I kept shaking his hand! Such a doofis! He is now my fantasy man….I will call him Mr. Big! Carrie did get him in the end and with some positive vibes I will as well. I did however take the opportunity to leave my business card in his windshield. He did make it a point of telling me which car he drove and where it was parked. He hasn’t called yet…but I am grateful for the fantasy. It really doesn’t matter if he does or doesn’t, but the ride was wild and I loved being in that spot at that moment! Another thing to build my courage on! I faced my fear and I survived! And I am still happy! Go Figure??? I walk with a limp because of my hip and my ankle…It was priceless to watch me trying to sache away without one!!!! What the hell was that? LOL!!! In conclusion: Life is suppose to be fun! I have been floating all day! I’m really not sure if anyone is reading this blog or not! But my intention is to maybe give a little hope, share a laugh or two and maybe some inspiration who knows. I am letting the Universe know that I am here and I am alive and living in the vortex!!!! Namaste!